Join the discussion on our forums! Come discuss Dr. Morrigan over in our dedicated Dr. Morrigan discussion topic. Deathrattle: Swap this with a minion from your deck. She will NOT STOP until she gets tenure. Been messing around with a cubelock with this card since I got it as my golden. It can be fun when you get the cube and keep shuffling the 3 of them around. Of course, this deck is far from meta, but the immediate 8 additional turns without fatigue is worth the trouble and whenever they kill a Morrigan it just summons another. I have not seen or found a limit to this effect other than when you run out of cards it doesn't go back into your deck. 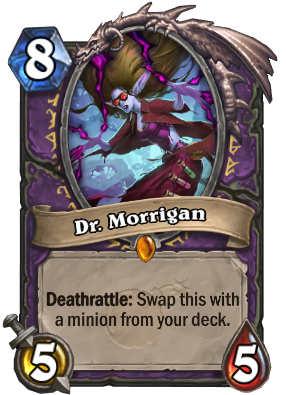 Some interesting effects of this card include, It replaces a card in your deck so Elekk will not place an additional Morrigan into your deck. This is because Morrigan lacks the "shuffle" keyword. In Wild since morrigan technically dies she can be resummoned every turn with Kel'Thuzad and N'zoth the Corruptor. You must be careful with N'zoth because i have summoned a full board of Morrigans before. Any minion placed onto the field will still trigger Knife Juggler but not cards like Holomancer im not sure if this is intentional, but it is interesting. While using this card i do agree that it should be used as a kind of Meat Wagon type play, but not in a sense of getting a large minion onto the field early but more as a method of retaining board presence. One way to do this is use Silver Vanguard to summon morrigan which in turn summons another minion. 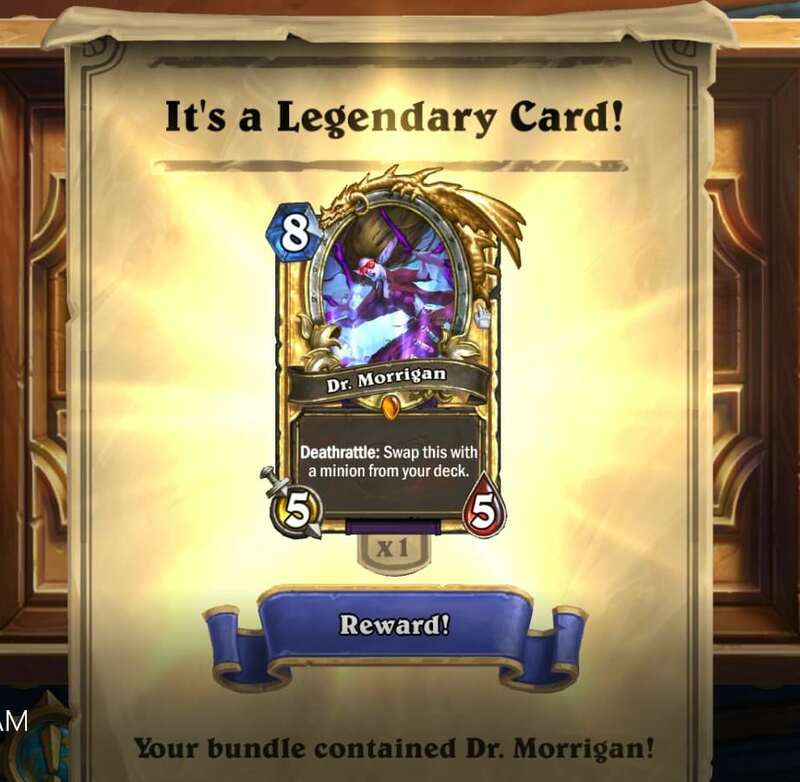 while Vanguard lacks any competitive stats it is a good way to sneak on a free Voidlord or other similiar card while they are wasting power and effort to remove Vanguard and Morrigan. Any minion placed onto the field will still trigger Knife Juggler but not cards like Holomancer im not sure if this is intentional, but it is interesting. It is intentional. Knife Jugglertriggers whenever a minion is summoned, whether is by playing it, a deathrattle, a spell... etc. Holomancer only triggers when your opponent plays a minion from there hand. It's a small difference in wording, but a big difference in the mechanics. Got this card in Golden, what should I craft with it? ofc I got this piece of crap as my the class legendary -_-' !!! OFC!!!!!!! i got her? should i dust? Same my dude. I guess I'll hold on to her, at least until Toast or Hysteria figure out an insane combo for her. Yeppp this just happened to me. I had a feeling the moment I read a thread about how crap she was going to be - That's going to be my golden. Dust it for 1600 and craft yourself the legendary you want most? With this update, card copies will retain enchantments in the following scenarios. Cards that are resurrected currently do not and will continue not to retain any enchantments, unless specifically stated otherwise.